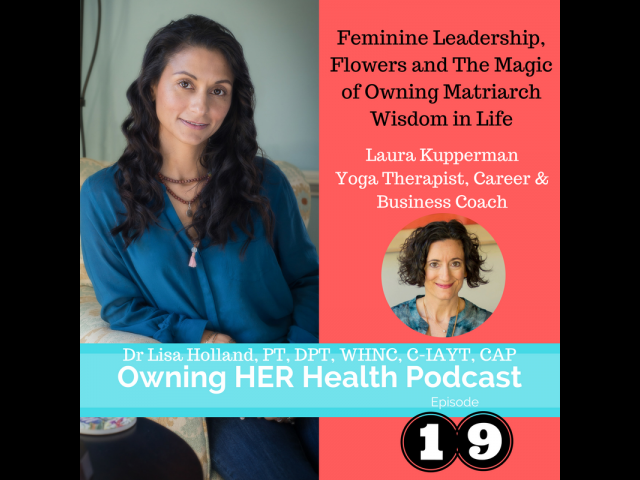 I had the pleasure of interviewing Prominent Yoga Therapist, Business Coach and Yoga for Survivors(R) creator Laura Kupperman in a very Matriarch Wisdom conversation that held the amazing energy of two passion filled entrepreneurs that are inspired by their feminine wisdom. Laura has been featured in numerous media outlets such as The Elephant Journal, LiveStrong Quarterly and Los Angeles Times for her leading lady work in Yoga Therapy and Business mentoring. So what makes this episode different than my others? This is the first episode I had the opportunity to talk shop with my lady biz mentoring hat on. We cover several important topics women who lead, whether at home or out in the world, need to know so for those of you who are struggling with that bolder voice, this will be an energetically lifting episode for you. This is also the first episode where my featured guest was talking from a place of such relevant loss as woman, the loss of her own mother at ten years old which I found to be very inspiring. What I find most interesting is how early, after losing her first mirror for reflection of a woman in this world, Laura was able to flip that pain, make decisions that were not always popular and guide herself a couple of times to navigate her skill set and service points in this world. If you are someone who is thinking they wasted their time studying such and such, only to find themselves in a seemingly completely different career now, Laura's path to goddess wisdom will CALM your mind. My one real take away about Laura is that she is a woman that is not afraid to tell others that she is doing her own shadow work in order to become more of a light for her tribe. THIS IS AN IMPORTANT NEED in order to truly become authentic in your guiding work. In many ways I think the loss of such an influential mirror as a mother, early on, just before life lit that Maiden Fire might have given her an intuitive advantage to look at HERself in the mirror and not see her mother during formative years. While this hold the potential for heartache, having that constant mirror, especially in the case where mom is so bright and you are not yet, is actually a real battle for many women I see in pain on multiple levels of self worth and personal service to this world. I am sure Ma Guru, the Universe gave her the path because she alone could create a wisdom. There are fingerprints such as her wonderful program Yoga for Survivors(R) as well as the changes she has made to many as an influential mentor that can only be patterned by some wanting to see themselves in their work. Laura Kupperman is presently organizing her involvement as co chair of the Yoga Business oriented CIC #6 pre conference offering at this year's Symposium on Yoga Therapy and Research which I will be joining her on as a presenter as well in that community. I can not wait because it is always a great energy, I can learn as well as self care and network with so many spirit filled licensed health care providers. I know we both give a shout out on the call for you to head on out to Newport CA and join us in the fun June 15-18. Be sure to tweet #GGoddessWisdom so I can find you if you travel there! You can also connect with her and benefit from her coaching support via her website and Facebook pages below. Her website has great Free resources for anyone to get started gathering a tribe of their own!